Introduction: Sleep-related disorders (SRDs) though frequent, are under-reported and their implications are often neglected. Objective: To estimate SRDs in an apparently healthy South Indian population. Materials and Methods: Data was collected by administering a questionnaire including Sleep Disorders Proforma, Epworth Sleepiness Scale, and Pittsburgh Sleep Quality Index (PSQI) to 1050 apparently healthy attendants/relatives of patients attending a tertiary healthcare institution. Results: The mean age of the respondents was 35.1±8.7 years with even gender distribution (male: female; 29:21), work hours were 7.8±1.33 h and had regional representation from the southern Indian states. The majority of the respondents did not report any significant medical/psychiatric co-morbidities, hypertension was noted in 42.6%, in one-fourth, the body mass index (BMI) was >25, and in 7.7% the neck size was >40 cm. Daily tea (70.3%) and coffee (17.9%) consumption was common and 22.2% used tobacco. Average time-to-fall-asleep was 22 min (range: 5-90 min), average duration-of-actual-sleep was 7 h (range: 3.5-9.1 h) with the majority (93.8%) reporting good-quality sleep (global PSQI ≤5). The reported rates of SRDs varied between 20.0% and 34.2% depending on the instrument used in the questionnaire. Insomnia, sleep-related breathing disorders (SRBD), narcolepsy, and restless legs syndrome (RLS) were reported by 18.6%, 18.4%, 1.04% and 2.9%, respectively. Obesity was not strongly associated with SRBD. in 51.8% of subjects with SRBD BMI was <25 kg/m 2 . Of the respondents with insomnia, 18% had difficulty in initiating sleep, 18% in maintaining sleep and 7.9% had early morning awakening. Respondents attributed insomnia to depression (11.7%) or anxiety (2.5%). Insomnia was marginally high in females when compared to males (10.3% vs. 8.3%) and depression was the major reason. RLS, which was maximal at night, was responsible for delayed sleep onset (74.2%). Other SRDs included night terrors (0.6%), nightmares (1.5%), somnambulism (0.6%), and sleep-talking (2.6%). Family history of SRDs was present in 31.4% respondents. While, only 2.2% of the respondents self-reported and acknowledged having SRD, health-seeking was extremely low (0.3%). Conclusion: SRDs are widely prevalent in India. Considering the health implications and poor awareness, there is a need to sensitize physicians and increase awareness among the public. The International Classification of Sleep Disorders includes over 80 sleep disorders, divided into six symptom-based categories: hypersomnia, insomnia, parasomnias, sleep-related breathing disorders (SRBD), circadian rhythm sleep disorders and sleep-related movement disorders. Sleep-related disorders (SRDs) not only impair quality of life but also pose several health-related problems and have been considered "an unmet public health problem". Recognition and treatment of these disorders may help to prevent cardiovascular diseases, psychological disturbances, and accidents and also improve individual performance. ,,, About 20-30% of the general population is estimated to have various types of sleep disorders. Approximately 50- 70 million Americans chronically suffer from disorders of sleep and wakefulness. Realizing the magnitude and huge economic impact, sleep medicine is an established discipline in the developed countries. In India, sleep medicine is a new discipline practiced only in urban areas and research is limited with sparse data on the exact burden. Predominantly, literature from the subcontinent deals with SRBD. ,, This study was conducted to estimate the prevalence of SRDs in an apparently healthy population in South India and also establish normative data in the Indian context. The present paper reports the epidemiological component of the study. This was a cross-sectional study conducted at the National Institute of Mental Health and Neurosciences, Bangalore, jointly by the departments of Neurology and Epidemiology over a one-year period. The study protocol was approved by the Institution Ethics Committee. Informed consent was translated and back-translated into five different regional languages spoken in South India. The pilot study assessed the feasibility and applicability of the questionnaire in 50 individuals and estimated problems in response. Based on an assumption of 10% prevalence of SRDs in the general population, 20% relative error and accommodating for non-response, the minimum number of subjects to be interviewed was estimated at 1035. Apparently healthy subjects accompanying patients to the outpatient department of Neurology were requested to participate. Exclusion criteria included: subjects younger than 15 years or older than 55 years; institute staff members; and subjects with medical or surgical condition. Those who consented were explained about the study and written informed consent was taken. The overall response rate was > 95% and 1050 subjects were interviewed using the pre-tested and validated proforma. The proforma had two parts: Socio-demographic information (Part 1) and sleep-related questionnaires (Part 2). Information pertaining to demographic variables (age, gender, marital status, education and occupation), anthropometric measurements, sleep environment, bedtime routine and habits, sleep schedule and general health status of subjects were enquired. Details of significant past history and family history were also enquired. Pittsburgh Sleep Quality Index (PSQI),  Epworth Sleepiness Scale (ESS),  modified ESS (mESS) and Sleep Disorders Proforma (SDP)  were utilized to evaluate sleep quality and identify individual disorders [Annexure ]. The study questionnaire was validated for its contents and format. Respondents completed the questionnaires under supervision, after a detailed explanation. One of the authors monitored the study to ensure quality (bi-weekly monitoring meeting, random cross-checking of forms, etc). All persons reporting problems with sleep were referred to the sleep disorder specialist. The expert reviewed the questionnaire and undertook clinical evaluation. Clinical evaluation by the sleep specialist was considered as gold standard for the presence of sleep disorder. No laboratory investigations were undertaken during the present study. The data was entered into an Excel datasheet and SPSS (Version 15.0) was used for statistical analysis. Descriptive and analytic statistics as relevant were applied. Mean (±SD) was calculated for continuous variables. The study enrolled 1050 healthy subjects prospectively. Most were from Karnataka while residents of the other three southern Indian states were represented [Figure 1]. Mean age of respondents was 35.1 ± 8.7 years (range: 16-55 years) with the majority in the third to fifth decade [Figure 2]. Male to female distribution was 29:21. There was a fair representation of different occupations: Professionals (1%), semi-professionals (23%), skilled workers (22.5%), semi-skilled workers (1.6%), unskilled workers (21.3%), housewives (27.5%), unemployed (0.2%), students (2.7%) and retired individuals (0.3%) [Table 1]. Average daily work hours were 7.8±1.33 h (range: 5-24 h) and weekly work hours 51.0±7.47 h (range: 35-96 h). Thirty-four (3.2%) respondents had rotatory shift duty (weekly: 0.6%, monthly: 1.2% and yearly: 1.4%). Sixteen (1.5%) respondents had only night duty. Interestingly, one-third of the respondents reported that shift duty affected their sleep. Mean body mass index (BMI) was 22.6±4.05 kg/m 2 (range: 12.3-40.1 kg/m 2 ) and mean neck circumference was 34.0±3.72 cm (range: 24-46 cm). In 30 (2.9%) respondents the BMI was > 30 kg/m 2 and in 263 (25.1%) respondents it was > 25 kg/m 2 and only one person had BMI exceeding 40 kg/m 2 . Neck circumference was greater than 40 cm in 81 (7.7%) subjects. Single-point elevation of blood pressure was noted in 447 (42.6%); 140 (31.3%) had systolic blood pressure > 140 mmHg and 307 (68.7%) had diastolic blood pressure > 90 mmHg. Detailed historical assessment revealed that nine (0.9%) had arthritis, five (0.5%) seizures, one (0.1%) each had psychiatric problems and non-disabling stroke. History of tonsillectomy was reported by one (0.1%), head injury by 19 (1.8%) and brain tumor/lesion by 27 (2.6%). Daily tea, coffee and alcohol consumption was reported by 738 (70.3%), 188 (17.9%) and 21 (2%), respectively. Average consumption of tea/coffee was 2.8 cups per day. More than one-fifth (22.2%) reported tobacco use [smoking cigarettes: 93 (8.9%), smoking bidis: 99 (9.4%) and chewing tobacco: 41 (3.9%)]. PSQI provided information regarding overall sleep architecture. Average sleep latency was 22.08±13.76 min (range: 5-90 min). Average total sleep time was 7.03±0.77 h (range 3.5-9.05 h) [Table 2]. Overall subjective sleep quality was good in 93.8% (global PSQI ≤5). 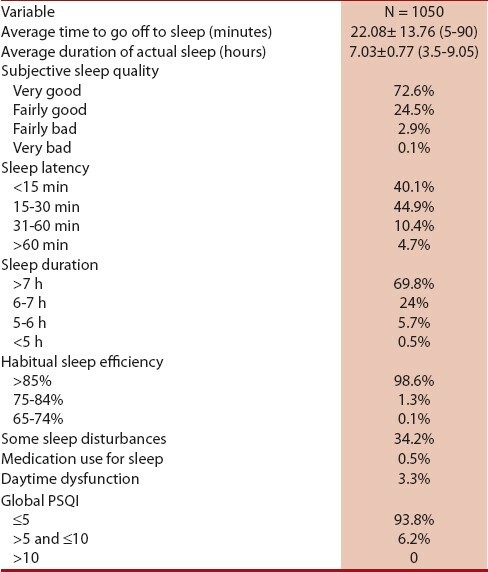 Sleep disturbances were noted in 358 (34.2%) based on PSQI. The predominant disorders detected by PSQI were insomnia (20.4%), sleep apnea (7.8%) and restless legs syndrome (RLS) (1.1%). SDP revealed significant sleep-related problems in 20%. Snoring was noted in 193 (18.4%) respondents. However, only seven respondents reported sleep apnea with choking, four had excessive daytime sleepiness (EDS) and motor movements after the apneic pause. Other symptoms suggesting obstructive sleep apnea (OSA) such as dryness of mouth and nocturia were reported by 19 (1.8%) and 56 (5.3%) respondents respectively. While night sleep was unrefreshing in 20 (1.9%) respondents, 116 (11.1%) respondents had morning headaches. Overall frequency of SRBD was 18.4%. However, OSA could be inferred in only 25 (2.4%) respondents. Obesity was not strongly correlated with SRBD. Amongst respondents with SRBD, BMI was ≥25 kg/m 2 in 48.2% (14% had BMI > 30 kg/m 2 ) respondents. Similarly, only 20% respondents with OSA had BMI ≥30 kg/m 2 . Narcolepsy with cataplexy was inferred in 11 (1.04%) respondents. Sleep paralysis was reported by three (0.3%), cataplexy with laughing by two (0.2%) and cataplexy with other strong emotions by 10 (1%). Two (0.2%) experienced micro-sleeps and 33 (3.1%) had hypnagogic hallucinations. Diagnosis of narcolepsy without cataplexy could not be made in the absence of polysomnography. Compared to hypersomnia, insomnia was noted in greater proportions [48 (4.6%) vs. 195 (18.6%)]. Difficulty in sleep initiation and maintenance was observed in 18% each and 7.9% had early morning awakening. No significant gender bias was noted. Insomnia was attributed to depression in 123 subjects (11.7%) and anxiety in 26 (2.5%). Female preponderance was noted in insomniacs with depression (74.1%: 47.1%) and anxiety (17.6%: 8%). RLS, fulfilling the essential criteria of the International RLS Study Group, was noted in 30 (2.9%) respondents. Symptoms were maximal at sleep onset in nine (29%), at night in 13 (42%) and during daytime in eight (26%) subjects with RLS. Paraesthesias and discomfort involved lower limbs in 22 (71%), upper limbs in one (3.2%) and both in seven (23%) subjects with RLS. Twenty-seven (87.1%) subjects with RLS reported increased restlessness directed towards symptom relief. The predominant mode of relief of symptoms was rubbing of extremity (64.5%); walking about, pressing of extremity and tying cloth on the extremity was reported by four (12.9%), five (16.1%) and one (3.2%), respectively. RLS symptoms delayed sleep onset in 23 (74.2%) patients. There was no definite correlation of RLS with alcohol intake (16.7%). Amongst parasomnias, night terrors were noted in six (0.6%) respondents, only one subject experienced them three to four times weekly. Nightmares were observed in 15 (1.5%) respondents. They were rare in 11 and twice weekly in the rest. Somnambulism was noted in six (0.6%) respondents, three having episodes twice a week. Sleep-talking was the most frequent parasomnia [27 (2.6%)], occurring ≥ twice a week in 16 subjects. A significant proportion of respondents had family history of SRDs (330, 31.4%). The predominant family trait was snoring (328, 31.2%). Family history of EDS, insomnia and parasomnias was reported by one (0.1%), three (0.2%) and 10 (1%) respondents, respectively. None reported family history of narcolepsy, RLS or nocturnal enuresis. Using ESS, Q1, Q2 and Q8 were not applicable in 251 (23.9%), 18 (1.7%) and 451 (43%), respectively [Table 3]. On the contrary, using mESS, Q1 and Q2 were not answered by 476 (45.3%) and 18 (1.7%) respondents, respectively. Both ESS and mESS achieved similar scores suggestive of EDS in one (0.1%) and two subjects (0.2%), respectively. Hence, the present attempt at modification did not yield any significant advantage. On direct questioning, 23 (2.2%) respondents acknowledged suffering from a sleep disorder and only three had sought medical help. While only one person reported use of 'sleeping pills', some form of medication to assist 'sleep' was taken by 11 (1.1%). Changing lifestyle, work profile, eating habits, leisure activities and different life stresses influence sleep patterns and result in SRDs. Sharing common risk factors with non-communicable diseases, SRDs are an important emerging health issue in a rapidly changing India. No Indian studies have provided information about sleep disorders in the general population. This study found SRDs in nearly one-fifth of an apparently healthy, productive age group of the Indian population. The reported prevalence of OSA in India was 9.3% and OSA syndromes 2.8%. The independent risk factors included male gender, BMI > 25 kg/m 2 , and abdominal obesity. 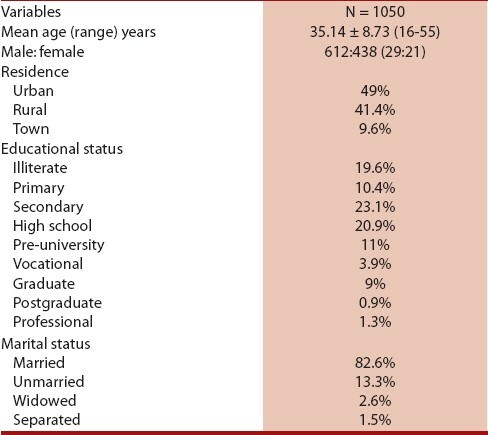 Prevalence of symptomatic OSA in middle-aged Asians was similar to Caucasian populations. However, in our study SRBD was common, but the prevalence of OSA was less. The limitation of the study is that the data is questionnaire-based. Polysomnographic evaluation may increase the detection rate of OSA. Asians are at risk for a more severe form of OSA for lesser degrees of obesity than Caucasians because of craniofacial structural factors. This is also illustrated in our study as over half of the subjects with SRBD were non-obese. A noteworthy observation of our study was the low perception of sleep-related problems. This reflects on the poor knowledge and awareness about sleep disorders and their health-related negative consequences in India. Lack of health-seeking behavior coupled with a lack of awareness could have possibly understated various sleep disorders. This necessitates a twin-pronged approach targeting awareness levels and provision of services. A key component should include educating healthcare providers. Epidemiological studies done in different parts of the country in specific populations would bring to the fore other parts of the 'iceberg', ramifications and the larger public health-related issues. The present study, despite its limitations, reveals the prevalence of sleep-related problems to be higher than expected in an apparently normal Indian population. Lack of awareness is a major influencing factor. In addition, critical evaluation of the prevalent questionnaires used to identify or diagnose sleep disturbances and sleep-related disorders is warranted in the Indian context. Sleep Disorders Proforma (SDP): This questionnaire prepared from Case Western Health Reserve and the Sleep Disorders Questionnaires , is relatively simple, easy to administer yet comprehensive. There are 44 questions divided into four sections. Section 1 contains questions on demographic information, age, education race, weight, height, and neck circumference. Section 2 enquires about presence/absence of sleep disorder and further defines its nature (excessive daytime sleepiness, decreased sleep, abnormal behavior in sleep). Section 3 contains questions relating to major sleep disorders such as obstructive sleep apnea, narcolepsy, insomnia, restless legs syndrome and parasomnia. Section 4 contains questions about associated medical illness, current medication, and personal habits (smoking/alcohol use etc. ), usual bedtime and wake time. The self-rating questionnaire evaluates sleep quality over the past one month. Nineteen items generate seven component scores: A. subjective sleep quality, b. sleep latency, c. sleep duration, d. habitual sleep efficiency, e. sleep duration, f. use of sleeping medication and g. daytime dysfunction. The sum of these seven component scores yields one global score. Apart from the first four open questions, the rest were assessed on a 4-point scale. Each component score has a value of '0' (no difficulty) to '3' (severe difficulty) and therefore a value > 0 will be considered as abnormal. The global score can range from '0' to '21' and a score > 5 suggested poor sleep quality. This questionnaire requires 5-10 min for the subject to complete and 5 min to score. The PSQI has adequate psychometric properties. A PSQI > 5 had sensitivity of 89.6% and specificity of 86.5% for patients and normal middle-aged controls. The test-retest reliability with scores can be correlated to the polysomnographic results, however, the result depends upon the subjects' interpretation of sleep disorder. 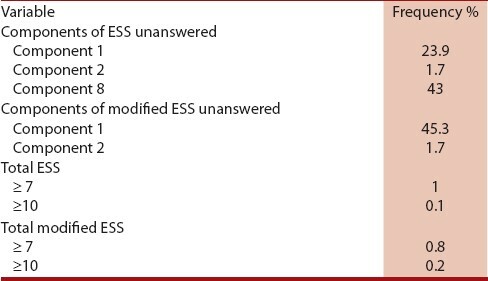 Modification of ESS: ESS gives a cumulative score based on eight questions and the Excessive Daytime Sleepiness (EDS) assessed by it is generally considered to be reliable. However, question Q1, Q2, Q3, Q4 and Q8 were felt to be difficult to be directly applied in the Indian context and hence were modified; while Q1, Q2, Q3 and Q4 were redefined to suit Indian conditions, Q8 was completely recast. Both original and were administered. SDP provides detailed questions to clarify the presence or absence of the sleep disorders. The ESS assesses EDS and is one of the most widely used instruments to measure the general chronic perceived level of sleepiness, defined as sleep propensity that is resistant to circadian and day-to-day variations. The PSQI emphasizes on insomnia and OSA. Unlike SDP, ESS and PSQI are not suited to pick up other sleep-related disorders such as parasomnias, restless leg syndrome and narcolepsy. 1. ICSD- The international classification of sleep disorders: Diagnostic and coding manual; 2 nd ed. Westchester, Illinois: American Academy of Sleep Medicine; 2005. 2. Colten HR, Altevogt BM, editors. Sleep disorders and sleep deprivation: An unmet public health problem. Washington DC: National Academies Press; 2006. p. 67-209. 3. Gilling JC. Are sleep disturbances risk factors for anxiety, depressive and addictive disorders? Acta Psychiatr Scand Suppl 1998;393:39-43. 4. Johnson LC, Spinweber CL. Good and poor sleepers differ in Navy performance. Mil Med 1983;148:727-31. 5. Mitler M, Carskadon MA, Czeisler CA, Dement WC, Dinges DF, GraeberRC. Catastrophes, sleep, and public policy: Consensus report. Sleep 1988;11:100-9. 6. Suri JC, Sen MK, Adhikari T. Epidemiology of sleep disorders in the adult population of Delhi- a questionnaire based study. Indian J Sleep Med 2008;3:128-37. 7. Udwadia ZF, Doshi AV, Lonkar SG, Singh CI. 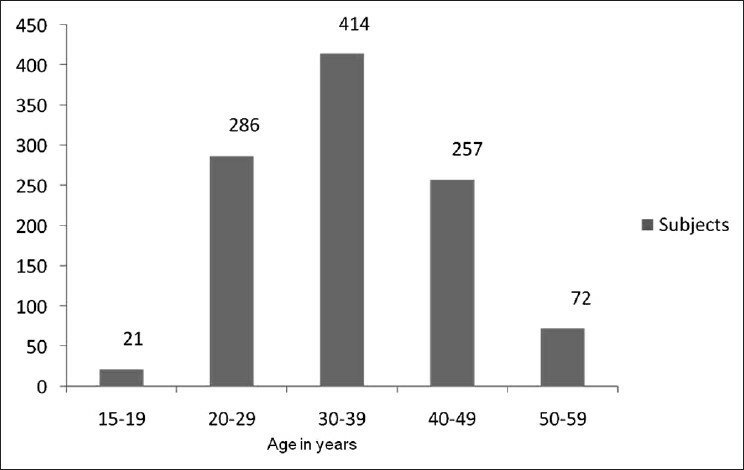 Prevalence of sleep-disordered breathing and sleep apnea in middle-aged urban Indian men. Am J Respir Crit Care Med 2004;169:168-73. 8. Vigg A, Vigg A, Vigg A. Awareness of issues related to sleep disordered breathing amongst practicing physicians. Indian J Chest Dis Allied Sci 2005;47:25-9. 9. Shah N, Bang A, Bhagat A. Indian research on sleep disorders. Indian J Psychiatry 2010;52: S255-9. 10. Buysse DJ, Reynolds CF, Monk TH, Berman SR, Kupfer DJ. The Pittsburgh Sleep Quality Index (PSQI): A new instrument for psychiatric research and practice. Psychiatry Res 1989;28:193-213. 11. Johns MW. A new method for measuring daytime sleepiness: The Epworth Sleepiness Scale. Sleep 1991;14:540-5. 12. Bhatia M, Prasad K, Pandey RM. Inter-observer and Intra-observer Reliability of a Sleep Questionnaire in Indian Population. J Assoc Physicians India 2004;52:464-6. 13. Ancoli-Israel S, Roth T. Characteristics of insomnia in the United States: Results of the 1991 National Sleep foundation survey. Sleep 1999;22:347-53. 14. Morin CM, LeBlanc M, Daley M, Gregoire JP, Merette C. Epidemiology of insomnia: Prevalence, self-help treatments and consultation initiated, and determinants of help-seeking behaviours. Sleep Med 2006;7:123-30. 15. LeBlanc M, Merette C, Savard J, Ivers H, Baillargeon L, Morin CM. Incidence and risk factors of insomnia in a population-based sample. Sleep 2009;32:1027-37. 16. Reddy EV, Kadhiravan T, Mishra HK, Sreenivas V, Handa KK, Sinha S, et al. Prevalence and risk factors of obstructive sleep apnea among middle-aged urban Indians: A community-based study. Sleep Med 2009;10:913-8. 17. Lam B, Lam DC, Ip MS. Obstructive sleep apnoea in Asia. Int J Tuberc Lung Dis 2007;11:2-11. 18. Villaneuva AT, Buchanan PR, Yee BJ, Grunstein RR. Ethnicity and obstructive sleep apnoea. Sleep Med Rev 2005;9:419-36. 19. Kumar Pradeep VG, Bhatia M, Tripathi M, Srivastava AK, Jain S. Restless legs syndrome: Diagnosis and treatment. J Assoc Physicians India 2003;51:782-3. 20. Rangarajan S, D'Souza GA. Restless legs syndrome in Indian patients having iron deficiency anaemia in a tertiary care hospital. Sleep Med 2007;8:247-51. 21. Rangarajan S, Rangarajan S, D'Souza GA. Restless legs syndrome in an Indian urban population. Sleep Med 2007;9:88-93. 22. Ng TP, Tan WC. Prevalence and determinants of excessive daytime sleepiness in an Asian multi-ethnic population. Sleep Med 2005;6:523-9. 23. Kuo A, Carlin M, Powell J, Dinges D. Chronic restriction of sleep to 4 hours per night for 14 nights changes performance linearly but not subjective sleepiness. Sleep Res 1998;21(Suppl):169. 24. Olson LG, Cole MF, Ambrogetti A. Correlations among Epworth Sleepiness Scale scores, multiple sleep latency tests and psychological symptoms. J Sleep Res 1998;7:248-53. 25. Douglass AB, Bornstein R, Nino-Murcia G, Keenan S, Miles L, Zarcone VP Jr, et al. The Sleep Disorders Questionnaire I: Creation and multivariate structure of SDQ. Sleep 1994;17:160-7. 26. Kump K, Whalen C, Tishler PV, Browner I, Ferrette V, Strohl KP, et al. Assessment of the validity and utility of a sleep-symptom questionnaire. Am J Respir Crit Care Med 1994;150:735-41. 27. Johns MW. Reliability and factor analysis of the Epworth Sleepiness Scale. Sleep 1992;15:376-81. 28. Johns MW. Sensitivity and specificity of the multiple sleep latency (MSLT), the maintenance of wakefulness test and the Epworth sleepiness scale: Failure of the MSLT as a gold standard. J Sleep Res 2000;9:5-11. Yang, J.S., Cho, Y.J., Kang, S.H., Choi, H.J. Sharma, P. and Shukla, G. and Gupta, A. and Goyal, V. and Srivastava, A. and Behari, M.
Karthik, N. and Kulkarni, G.B. and Taly, A.B. and Rao, S. and Sinha, S.